I was at a discussion the other day about science and the media. Some scientists and some journalists were there. As a scientist, talking to other researchers was a bit of an echo chamber – everyone had very similar comments, mostly negative, about the media coverage of science. There seem to be three main sticking points. Note that this is mainly relevant to news journalism – “Scientists today announced…”; feature writing largely avoids these issues. I think it also applies to the British media somewhat more than elsewhere. Time: Compared to science, journalists work at a supersonic speed. Whereas a scientific journal can claim “rapid publication” if it only takes two months from submission to print, a news journalist is expected to write up a story in hours. News must be new, and if one of their rivals scoops them, they lose the story. So even with the best will in the world, journalists are never going to be able to give stories what, to a scientist, would be “sufficient consideration” i.e. a couple of days thought at least. Expertise: The average scientist knows an awful lot about their sub-sub-speciality of a particular branch of science. By contrast most ‘science journalists’ are just that – they cover science, all of it. A few are lucky enough to have a “speciality”, like environmental issues or physics, but this is is still vast by scientific standards. They’re not stupid, and with a few days of study, I’m sure it would be possible for them to grasp the science behind every story they cover. However, they just don’t have that time. Goal: For a scientist, an interesting article is one which adds to their own understanding. Given that modern scientists are world experts in a very narrow field (see above), this means they are mostly interested in stuff which only they and maybe 20 or 30 other people will appreciate. To a journalist writing for an audience of millions, that’s by definition irrelevant. If this means they have to draw tenuous conclusions between the science and the hot topics that sell stories – cancer, children, cute animals, and controversies – they’ll just have to do that. 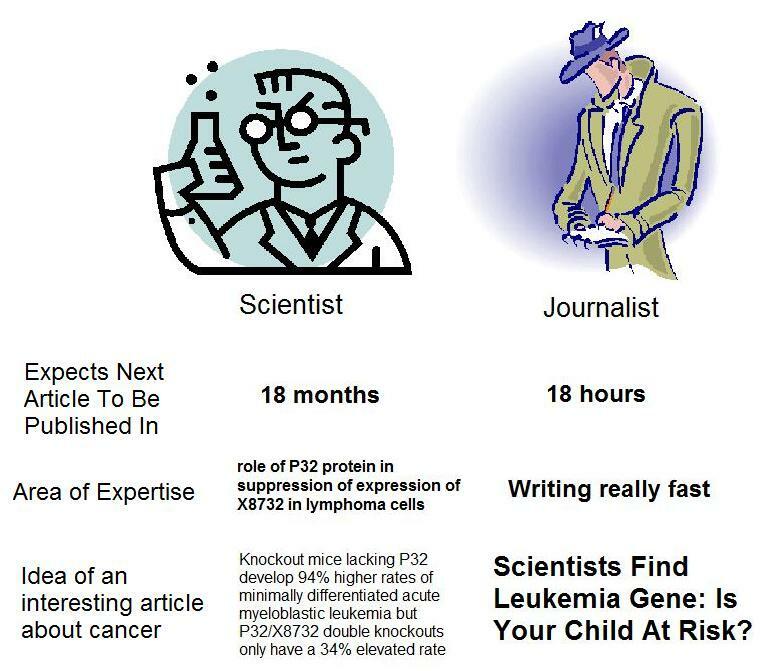 In summary, journalists and scientists have completely different agendas. So “good science journalism”, in the sense of stuff that scientists and journalists will be equally happy with, is a contradiction in terms. Except maybe in the rare cases of sudden breakthroughs that genuinely involve hot topics, like say the discovery of a cute new species. This is not the fault of individual journalists; it’s a structural problem. So my feeling is that reporting science as news is inherently flawed from a scientific perspective. The core of the problem is time. Even a world-expert scientist would struggle to make a serious evaluation of some new science in a few hours. A journalist who has to write about everything from swine flu to the Large Hadron Collider, all in the same day, has no chance. This is not the fault of individual journalists; it’s a structural problem. But the problem is not limited to science journalism. Newspaper journalism is in crisis as we all know. 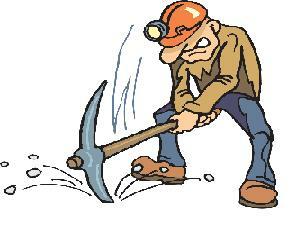 Sales and profits are falling so jobs are cut and the few remaining people have to shoulder the same workload. Cheap junior reporters and unpaid interns increasingly replace expensive veterans. Under enormous time pressures, journalists have no choice but to rely heavily on press releases. This can’t go for ever – something has to give. So what’s the solution? This is going to make me sound like a right arse but I think the answer is… blogging. Not as a replacement for science journalism, but as an complement to it. A science blogger can act as an intermediary between raw science and journalists. Bloggers generally write about what they know, bringing specialist expertise. Each individual blog has a fairly narrow specialist focus, but the other side of that coin is that they dig deeper than journalists can. Maybe it takes them a couple of days – but the stories they uncover are ones that inherently can’t be generated any quicker. Here’s a great example. Science blogs are a kind of second source of news stories on top of the primary literature. And they do this for free, which is lucky because no-one would pay us for it. Journalists obviously can’t just copy and paste from blogs, but I think almost any blogger would be only too glad for their work to be borrowed for a mainstream media piece so long as it contained a link back to the original (bloggers love to hate the mainstream media but nothing makes us happier than getting mainstream media coverage, seriously). Neuroskeptic is a British neuroscience with an attitude, writing at Neuroskeptic. Previous Post Doctors Love iPads. What Does It Mean? What Does It Mean? Next Post HealthNet and HIPAA Again…So, Does HIPAA Work?